Are Google the new dictators? Most people know that Google’s motto is “Don’t be evil”. But before I go any further please watch this video snippet for 2 minutes and 46 seconds. It’s A segment from the Australian show ‘Hungry Beast’ Aired on Australia’s ABC (Australian Broadcasting Corporation) network. Personally I like a lot of the things Google do, I use a lot of their products and I don’t want to turn this into a “let’s bash Google” article (but I probably will, a bit), it’s intended more as a thought provoker and for interest. As I consider writing this I wonder if I should be writing it here but, since my blog site is primarily about internet marketing and Google is a such big part of that then perhaps this is a good place to write it. And, let’s not just pick out Google; Facebook, PayPal and other major players are all at it. 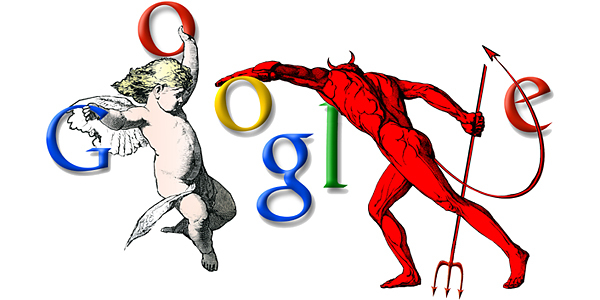 I believe that Google try fairly hard not to be “evil” but as the saying goes “Power corrupts, and absolute power corrupts absolutely” – John Emerich Edward Dalberg-Acton, and, when you get as big as Google or Facebook perhaps it becomes unavoidable. Anyway, let’s stick with Google. Google is one of the biggest hubs on the internet and they control us, oh yes they do! They censor, they rank, they make us jump through hoops, they move the goal posts. But hang on a minute, Google is a search engine, it’s not the internet police … is it? Actually, maybe the search engine side of things is not too bad (you think). If I type in “how to make a bomb”, stuff about making a bomb will come up. I haven’t looked into it thoroughly but I’ll assume that if I wanted to blow something up I could fairly easily figure out how to do it, off the internet (in fact I just found an article on how to make C4, although I won’t be testing it to see if it works or not). The trouble is, I see what I see but I don’t know about what I don’t see, I don’t know if Google are excluding some material or ranking it low, possibly because of its type of content. I thought about trying some other dodgy searches, just to prove a point but then I thought no, I won’t, because once I’ve hit the search button my query is out there for Google and who knows who else will see and, it would be coming from me. At this point you might think I’m being paranoid but … do you really think that? Ok, let’s look at Google Adwords. If Google don’t like your website then forget it, PPC is not going to be for you, whether you like it or not. But who’s to say? I mean, if I put out a dodgy rubber stamped product, hmmmm, let’s say PPI (Payment Protection Insurance) and fleece people for billions, then that’s ok isn’t it, after all its HSBC and Lloyds etc. but something like Empower Network (I’m not a member of Empower Network, I’m just picking them out because I know about this aspect In regard to them and they comes to mind) is not going to get a look in now is it and I wouldn’t exactly call them dodgy even if they are in your face quite a lot, not in the great scheme of things. See Dodgy Schemes – On the Internet for more thoughts in this area. Who decides? You might argue that Adwords is like a shop, if they don’t want to serve you then they don’t have to and you would be right but when a company is as big and influential as Google, it carries responsibilities beyond the norm. I use to read a lot of science fiction when I was a teenager, like a lot of male teenagers I guess. We read about big brother in 1984 and global companies taking over and controlling the world from their corporate monopoly, subtly and not so subtly, controlling the masses … starting to ring any bells? PayPal will only deal with who they want to deal with. The problem with this is it leaves the field open for other perhaps less scrupulous providers to fill the gap and they do. Sites that cannot use PayPal end up using other eWallets, some of these are quite good and some are not. My limited experience with eWallets is that their customer support is often one or a combination of; slow, dreadful or non-existent and I cry out sometimes, oh, “I wish I could use PayPal” because the vast majority of the time PayPal just works and the fees are reasonable. www.alliedwallet.com – I have only very limited experience with Allied but everything worked fine. www.payza.com (formerly AlertPay) – They do what they say they will do but their support is often very slow and you may need to chase them a bit. Having said that they have got better recently. They seem quite popular. www.solidtrustpay.com – I managed to open account but could not get it verified. They communicated with me poorly or not at all, after a reasonable number of attempts I gave up. Lots of people use them so I guess their service works ok but unless I have to, I will not be using them. www.i-payout.com – Some experience, everything straightforward so far. Facebook decide what they will accept what they will not accept, they ban what they like. The trouble is, most of us have Facebook accounts. Course there’s always Google+, isn’t there! BTW, If you use business social sites then I heartedly recommend www.sunzu.com (formerly www.ecademy.com). The folks there are very warm and supportive and if you cultivate relationships, there is good business to be had there. Of course we don’t want nasty stuff shoved in front of our faces do we! But who decides? Is it really up to companies like Google. Did we vote them in? Of course if governments get in on the game as they have been trying to do then we can probably expect more control and manipulation, you only need to look at countries like China to see the kinds of things that could happen. That kind of brings us full circle, who decides? Perhaps Google are a good choice to control things even if the whole thing is a bag of worms. I for one, cannot think of who I would trust to put in charge of controlling the internet or even who should decide what degree of control if any, should be levied. Some degree of balance and control seems necessary to me, seeing as some of us are unable to control ourselves but it remains a dilemma. Getting a high rank in Google is a lot of work these days and whilst it is possible for a lone person to achieve a high ranking in Google or Alexa the amount of work involved kind of puts it into the lap of companies who have the money and resources to throw at it. This is another form of control. This has always been there even before the dawn of the internet and in some ways I do believe that Google does try hard to level the playing field in this area, as best they can. Am I worried about upsetting Google, nah … well, er, not yet. It could be worse, at least to date Google have a more or less ethical stance but how things will progress it’s hard to say. They will probably get a lot bigger and the bigger an organisation gets the harder it is to control. There will always be some people who are doing what they are not supposed to be doing … often unnoticed until the damage is done (remember Nick Leeson of Bearings bank). There is rationalising, it’s easy to rationalise an action when it suits your purpose especially if a lot of money or benefit is involved, this is how corruption can start. Pingback: Bad Google? Are They Overstepping The Mark? So do you live here in Seattle or were you just visiting? I have visited Seattle but it was a long time ago.